African violets make useful flowering houseplants since they can bloom for up to nine months per year. They do need the other three months off as a rest period. As with any plant, proper care is essential to maximize both the plant's health and blooms. 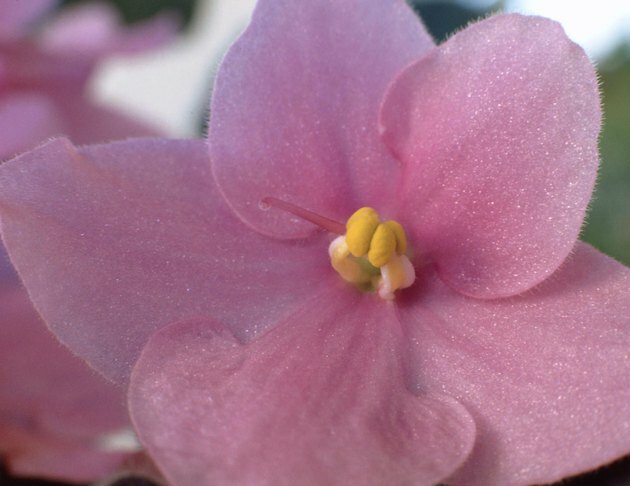 For example, with the African violet, allowing water on the leaves causes dead spots to appear, direct sunlight burns the plant and not removing old blooms causes a lackluster blooming period. Deadhead African violets to encourage more blooms. Check your African violet over for dead, dying and unhealthy blooms. If these are allowed to remain on the plant, they draw vital energy away from the plant's ability to produce new blooms. Grasp the dead, dying or unhealthy bloom in one hand. Snip it off with scissors just behind the dead or dying tissue. Refrain from ripping or tearing it off as this allows disease or fungus to enter the plant. Check the over your African violet every few days to a week during its blooming period. Continue to remove the dead, dying or unhealthy blooms as soon as possible to keep your plant looking in excellent condition. Elizabeth Knoll has been writing full-time since 2008. She has a deep love for gardening and has spent a vast amount of time researching that subject. Her work appears on various websites. Knoll received a certificate in Early Childhood Education from Moraine Park Technical College.